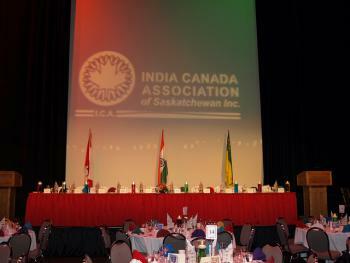 Each year, ICA hosts a Supper Night – a lively celebration of Indian cuisine and entertainment. What began as a small gathering has grown into one of the most prestigious fundraisers in the province, attracting over 500 participants in 2010. In order to achieve the scale and style it deserves, Supper Night for almost 15 years has been held in Regina’s Conexus Arts Centre (formerly Saskatchewan Centre of the Arts). Supper Night is a genuinely collective effort whose goal is two-fold: to showcase Indian cuisine and culture with the greater Regina community and to raise critical funds for those in need. The event simply could not be possible without the tremendous commitment of volunteers, sponsors, special guests, and venue staff – sincere heartfelt thanks to you all.